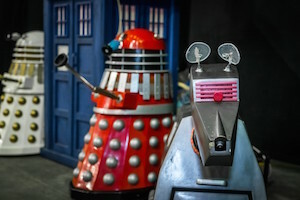 What can we learn about marketing from the daleks? When I was a child, like many others, I used to watch Dr Who from behind the sofa, terrified … but not wanting to miss out. The sound of the daleks filled me with dread and I could hardly bear to watch. A couple of years ago, I bought my Dr Who fan husband a box set of old Dr Who shows from the 70s, thinking they would be good fun. Wrong! They were unbearable! Watching one for 5 minutes was quite funny, as we wondered how on earth we could ever have been scared by such primitive props, but the novelty soon wore off and we just couldn’t watch a whole episode. And so it is with todays’ videos and presentations. If you’re going to do it, do it right. What worked even 5 years ago will look dated now. Do some research, and have a look at what others are doing – look outside of your own industry for inspiration. All of the social media sites are full of great, short and entertaining clips and infographics. Videos and presentations can be used on your website, your social media channels, within email bulletins etc so you can make good use of them … if they’re good. And by good I mean eye-catching, interesting, relevant to your audience. And hopefully not so out of date that your audience switches off!